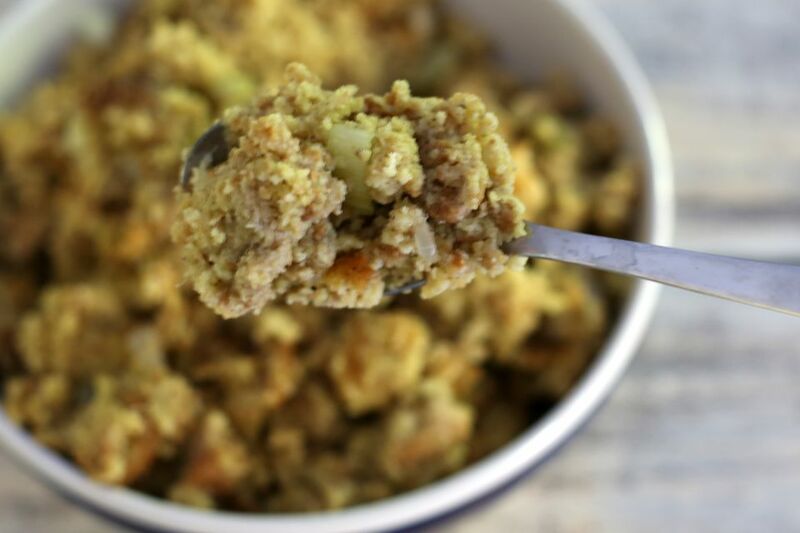 This classic dressing (stuffing) for chicken is an excellent side dish to serve with roasted or baked chicken, cornish hens, or turkey. If you decide to stuff a whole chicken, make sure to cook it safely. The temperature - at the center of the stuffing - must reach the safe minimum temperature of 165 F (73.9 C) when cooked in the bird. Let the chicken or hens stand for 15 to 20 minutes before removing the stuffing. Tip: Never store stuffing in the bird. Heat the oven to 325 F. Butter a shallow 2 1/2 to 3-quart baking dish. Heat the butter in a large saute pan over medium heat. Add the onion and celery and cook, stirring until the onion is translucent and celery is slightly tender. In a large bowl combine the onion and celery mixture with the bread cubes, freshly ground black pepper, salt, sage, and poultry seasoning. Add the chicken broth until just moistened. Taste and adjust seasonings. Whisk the eggs in a small bowl and then stir them into the stuffing mixture. Spoon the dressing into the prepared baking dish. Cover the baking dish tightly with foil. Bake in the preheated oven for about 35 minutes. Remove the foil and continue baking for 10 to 15 minutes longer. Use half cornbread crumbs along with the bread cubes.